It is good to be the king. In the absence of lineage and title, it is equally satisfying to have the watchmaker of kings cater to one’s aspiration. 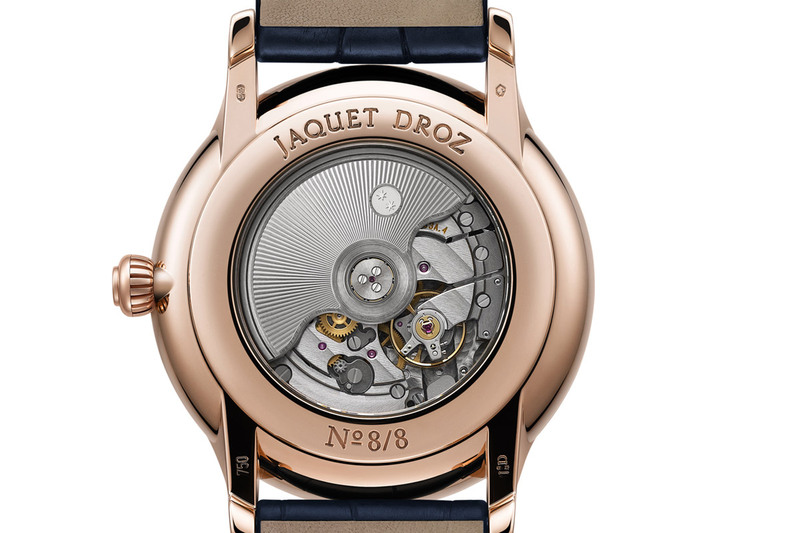 In 1758, watchmaker Jaquet Droz, in a profitable journey to the Spanish court, laded a carriage with six clocks. This inaugural trip paved the way for his automatons, clocks and watches to find their way into the courts of Europe and Asia’s kings and emperors – especially China’s. Last year’s Bird Repeater captured the automaton flair that entertained the nobility. 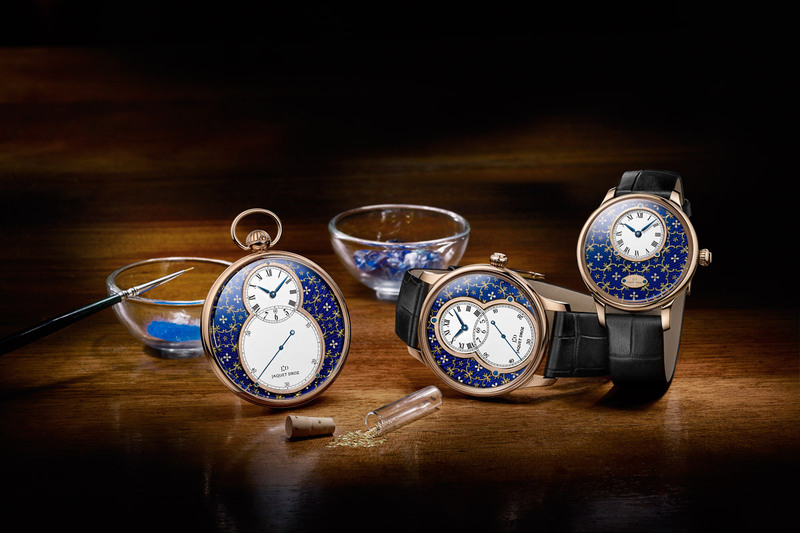 Now the Jaquet Droz company introduces three limited edition models with dials made by paillonné enameling, a specialty of the company since those itinerate days of the 18th Century. The paillonné dial makes a limited debut of 8 pieces each: in the 39 mm Petite Heure Minute, 43 mm Grande Seconde, and 50 mm pocket watch. 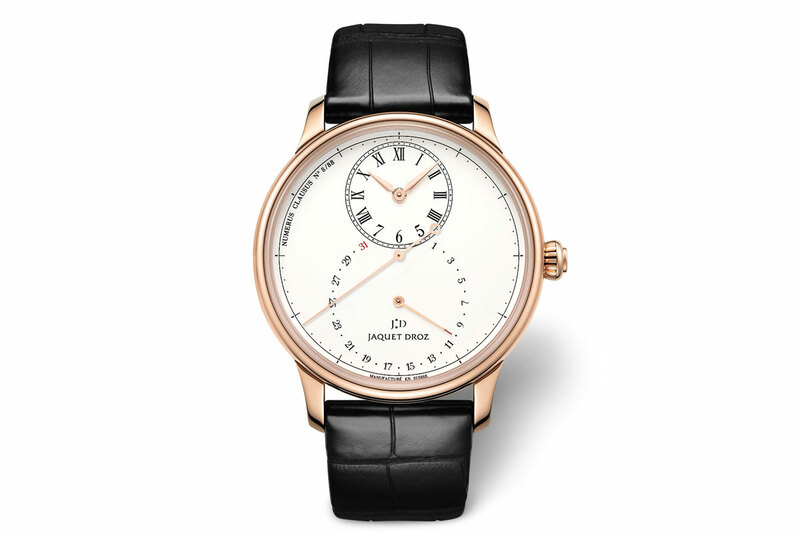 For the confident man desirous of a commanding dress (or pocket) watch which evokes a stylistic superiority, Jaquet Droz provides a rarity equal to its fabled patrons of the past. Enameling is an arcane art. When you consider all that can go wrong, from bubbles to cracks to discoloration, creating an enamel dial might seem as daunting as turning lead into gold, but unlike the mystical alchemist, the enamellist possesses the skill to turn dreams into reality. The art of enameling starts with a colored glass, containing other ingredients like potassium carbonate and borax, which is then ground by pestle in an agate mortar until a fine powder remains. The powder is washed and cleaned until it becomes a solution (and you thought a tourbillon was difficult). 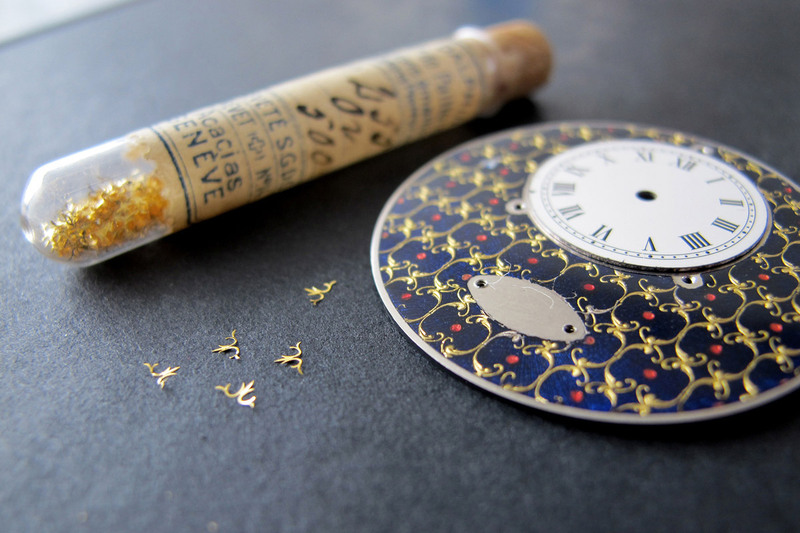 The simplest explanation of watch enameling is to apply an enamel solution to metal and use heat to fuse them together; but the process is far from simple. There is the oldest technique, Champlevé enameling, which fills a pattern cut into the dial; there is Grand Feu enameling that achieves its decoration in the baking process alone; there is Cloisonné enameling that places enamel into small cells made of wire; there is L’émail Plique à jour, which is similar to cloisonné except copper is used in the wire, and the copper later dissolves in the heat; there is Flinqué (a.k.a. L’émail de Basse taille) enameling which reveals a dial’s guilloche or pattern under the enamel (such is the case of the sunburst pattern visible under the blue enamel here); there is Grisaille (a.k.a. 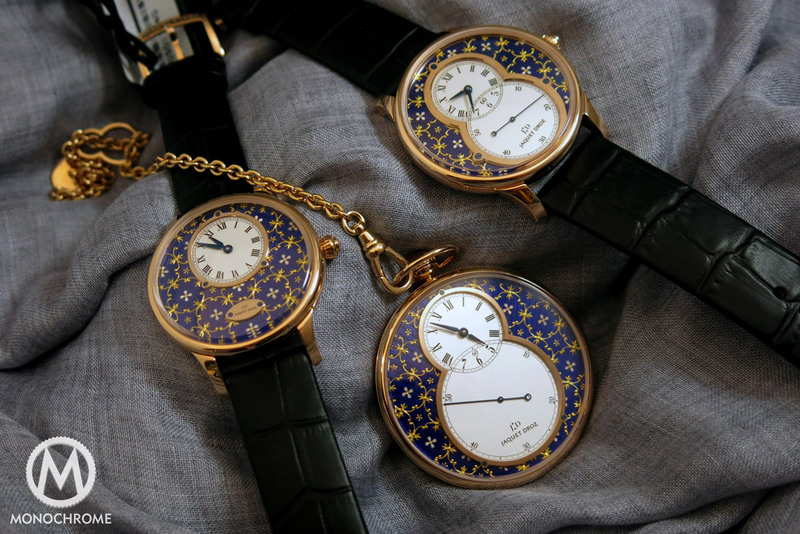 Contre Jour) enameling that only uses the colors black and white; there is Bespoke Painting on top of enamel dials; there is the Geneva Technique enameling that uses a transparent enamel to cover over a painting; and then there is the exquisite Paillonné enameling. 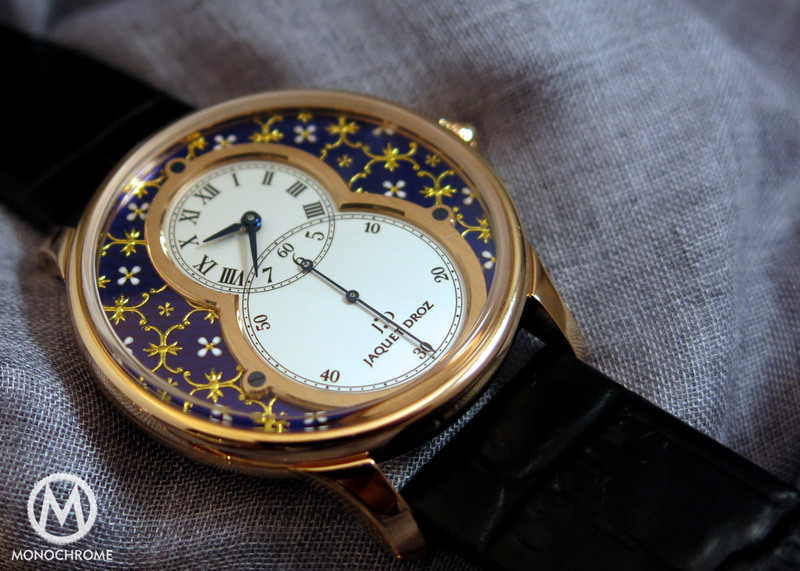 Jaquet Droz’s paillonné enamel technique is an intensive process that begins with a blue enamel dial forged over several firings in the kiln, which can reach a hellish 1,000 degrees Celsius. At the start, a solid gray gold dial receives a guilloche pattern to give it the sunburst that will be visible under the blue enamel, and the etching in the metal increases the adhesion of the enamel. Then the blue enamel is applied to the gold dial, and while the dial is baking, the color variant of the blue is attained by its own temperature configuration; only the trained eye can observe the perfect color consistency. 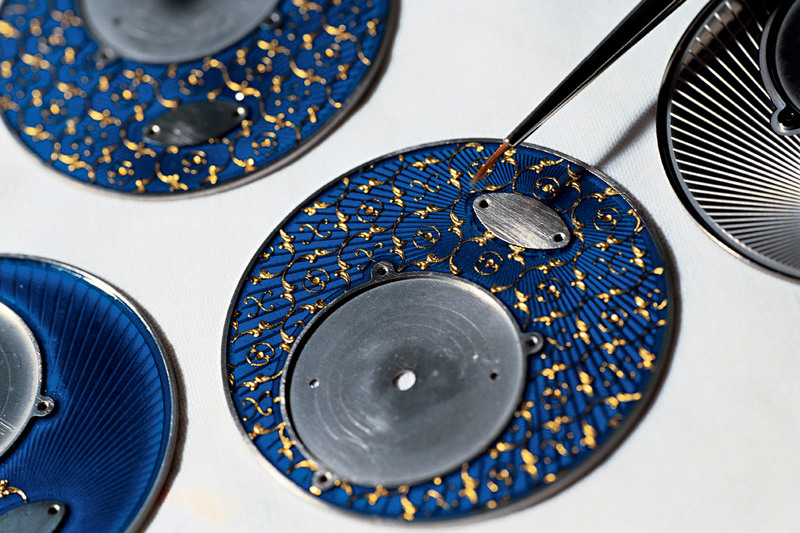 When the blue enamel dial is ready, the antique paillons (tiny motifs made from gold leaf) are hand placed with surgical precision to form a floral motif across the dials of all three models. 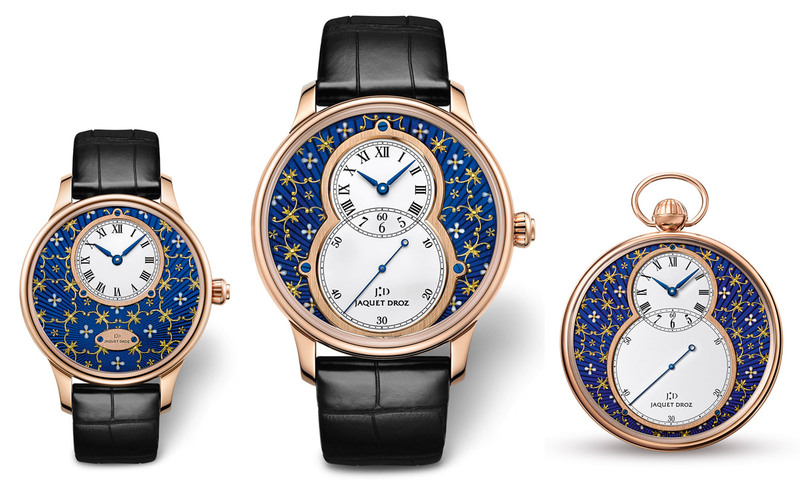 The gold flower shaped paillons use a drop of white enamel for their petals and together with the other gold paillons reprise a hand-applied pattern that was a favorite for the watchmaker Jaquet Droz. Once in place, the paillons receive an extra layer of translucent enamel fondant to secure them. In the end, the dial has silver opaline sub-dials or one sub-dial surrounded by an ornamented sea of blue enamel. The paillonné dials become a testament of an indefatigable craft, perfected throughout the centuries, as well as a personal statement of fathomless indigo and glittering paillon gold. There is more to a book than its cover, but in this case a discussion of movements feels anti-climactic. Nevertheless, inside and out, these watches possess a high caliber of achievement. 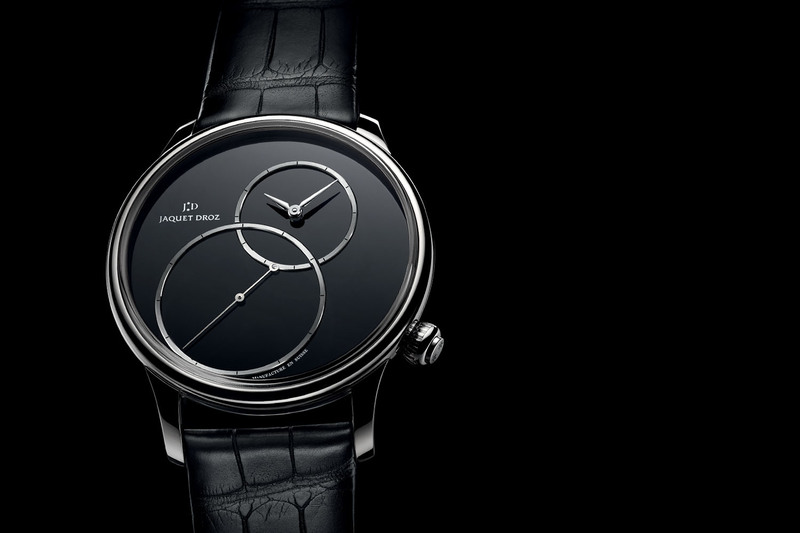 The Petite Heure Minute Paillonnée contains a JD 2653 automatic movement (30 jewels) with 68 hours of power reserve; the Grande Seconde Paillonnée has a JD 2663 automatic movement (30 jewels) also with 68 hours of power reserve; and the Pocket Watch Paillonnée has a JD 1615 hand-wound movement (20 jewels) with 40 hours of power reserve. 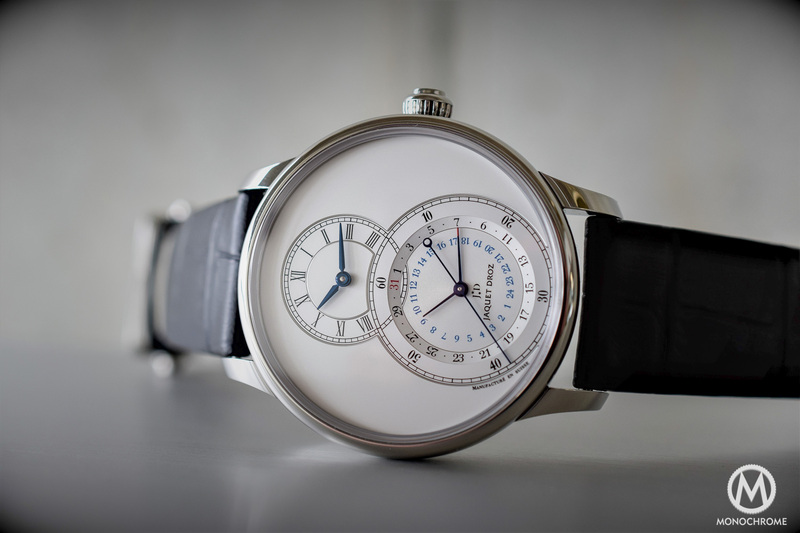 All the watches have 18–carat red gold cases, and blued steel hands. 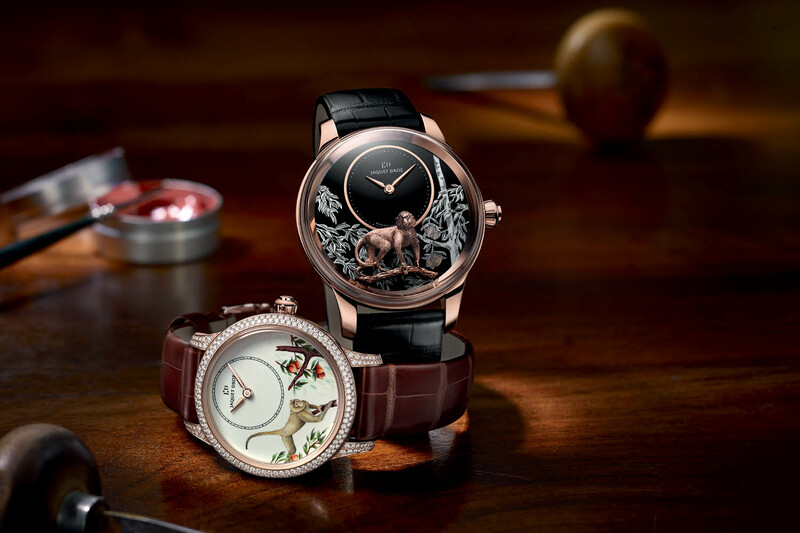 Recently, métiers d’arts (literally the craft of art), or the art of decorative dials, has been overwhelmingly reserved for women’s watches – think of Vacheron Constantin or Van Cleef and Arpels. 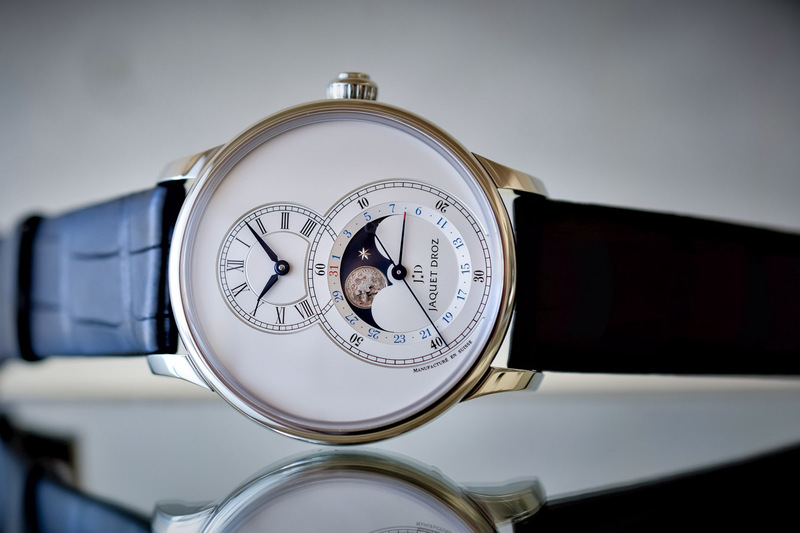 This year at Basel, we saw a number of Grand Feu enamel dials for men, but it is Jaquet Droz’s paillonné enameling that balances a revered tradition in watch making with a dominant wrist presence. When we first saw the watch, we drew a sharp breath, as if we were viewing the crown jewels or something so valuable only a privileged few are able to see it. For a man to wield such visual power on the wrist redefines the decorative dial. Considering the floral motif, the crucial question might be, “Is the watch masculine?” In a word, unequivocally, YES. Some key masculine elements are: the deep, regal blue color of the dial striking a low octave and having an appealing sunburst striping; familiar models from the men’s line reappearing here; and the choice of decorative pattern being analogous to the standard on a knight’s jousting shield. You may kneel and kiss the watch.